It was the most inflamed of times, it was the shiniest of times, it was the age of visible redness, it was the age of large pores, it was the epoch of angry skin, it was the epoch of visible shine, it was the season of dryness, it was the season of t-zone troubles…. 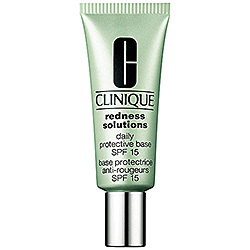 I tried CLINIQUE Redness Solutions Daily Protective Base SPF 15 without expecting much. I’d heard it all before — soothing, redness-reducing, blah blah blah. I’ve tried almost every green-tinted skin product out there, all of them made big promises to correct my angry red skin. 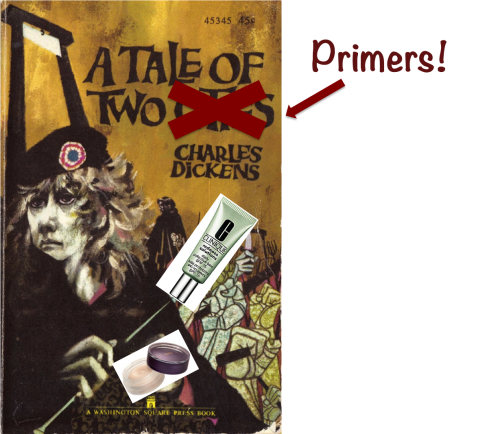 So, I wasn’t expecting much when I slathered the creamy, green dill-scented primer all over my face. It felt cool and comforting upon application. Then I looked in the mirror and noticed my skin looked borderline normal! Sure, there was still some visible pink but it wasn’t the usual “I just walked through a chemical fire” face. Protects skin from the UVA/UVB exposure that can aggravate skins with Rosacea or reactive redness. Does it without chemical sunscreens. Comforting, oil-free makeup primer with a sheer green tint visually corrects redness, evens skin tone. Overall, my skin looked healthy and dewy. This definitely isn’t the type of primer to give you that flawless airbrushed finish. My pores were still large and in charge and obviously the dewy finish wasn’t doing my shine any favors. 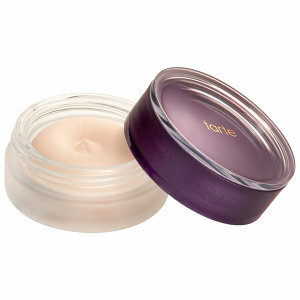 Tarte Timeless Smoothing Primer is a blurring primer to help fill in fine lines and enlarged pores, and put the kibosh on shine. If you have oily skin, this primer is your new best friend. It literally melts into the skin giving you an airbrushed, “blurred” finish. A melt-in smoothing primer with innovative blurring and filling technology for a youthful appearance perfectly primed for makeup application. Product Performance: Turn back the hands of time with tarte’s new timeless smoothing and filling primer formulated to fade out your biggest beauty boundaries such as large pores, fine lines and wrinkles. The antioxidant-rich formula infused with vitamins C & E and green bean extract gently melts into the skin delivering a surge of moisture, peptides and other naturally-derived elixirs for a firmer, smoother appearance. You’ll love the lightweight texture and fresh powder scent as it provides the perfect blank canvas to enhance the look and wear time of makeup. It can also be worn alone as part of your skincare regimen, blurring out skin imperfections and signs of aging for a flawless, soft-focus finish.